Passing on the Gift® (POG) is fundamental to Heifer's mission. As people share their knowledge, resources and skills, a global network of hope, dignity and self-reliance is created. Before receiving an animal, project participants are given training to help prepare for the challenges and problems they may encounter. During the month of March, Heifer International and its partners celebrate POG events that mark the social achievements of self-help groups and reflect on continued community development. One POG event was conducted by the Disability Development Services Program Organization (DDSP). During this POG, about 500 participants passed on 31 buffaloes, 24 cows, 232 swine, 1,215 chickens, 282 trees, about 155 pounds of animal feed and about 20,000 pounds of rice seeds. 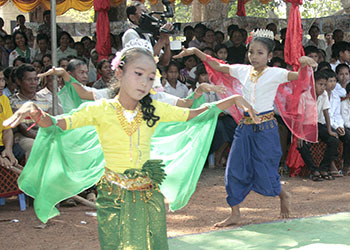 The ceremony was presided over by Chan Sorey, Secretary of the State at the Ministry of Women's Affairs, Heifer's country director and with participation of local authorities, students and teachers in Bot Rodol pagoda, Borodol village, Ptas Rong Commune, Phnom Krovanh district of Pursat province. Participants were welcomed and introduced to Heifer's history, mission, vision and activities, and a sapling was planted as a symbol of improved environment. Sorey said, "I am very interested in Heifer's and DDSP's insight strategy and implementation of a program to improve the livelihood of poor people with the Values-Based Holistic Community Development model and capacity building to help them to feed the animal, grow the vegetables and other businesses to respond to their basic needs in the community." At the ceremony, children from DDSP performed a traditional dance and recited poems about their hope for a better future with Heifer. "I am so excited today; I cannot believe that I can learn, be involved with and receive support from the community, because of my disability, with Heifer's support," one child said. Honorable guests and participants joined together to celebrate the event in front of a stage with their animals, rice seeds and vegetable seeds. Before the event concluded, a representative of the POG families asked Heifer International donors to continue their valuable support for the poor and to build strong relationships with those in poverty around the world. Find out how to fight hunger and poverty around the world. Where does my money go? Heifer prides itself in transparency and we are happy to have received 97% on Charity Navigator's accountability transparency rating. First Name Last Name Email Mobile Number (optional) If you're human, skip this field. You only need to enter this information once to download digital resources. Your gift will be matched! Your Gift Card is now active. You can purchase Gift Card-eligible items indicated with icon. Get your free Honor Cards after checkout. You've reached the maximum number of products for this item. Make a monthly gift instead? ? By making this item a monthly gift, the amount shown on this line will be charged automatically every month. Your first month's gift will be charged today.
? Gift donations are even better when you send a free Honor Card in the recipient's name. Your gift message will be included on a separate slip of paper in your package. Send an Honor Card? Does your order contain a gift? Great! We'll help you set up your free Honor Card after your donation is complete. Personalize your message up to 5 lines in length. It's not a hand out. It's a hand up. For maximum impact, try adding a few items to your basket. What motivated your gift today? If you have received a gift catalog in the mail please enter the highlighted code that begins with a "D" or a "P" in the source code box below. If you have not received a Heifer Gift Catalog please leave the source code blank. Shipping Address ? We cannot ship online orders outside the U.S. Please call us at 1-855-9HUNGER (1-855-948-6437) to place an order. Enter your company name to see if your employer will match your gift. Step 3 of 3 Step 3 of 3 Step 3 of 4 Select shipping method. Orders after 12:00 PM CST will be shipped the next business day. Orders on Saturday or Sunday will be shipped the next business day. We were not able to process your request. Please try again or contact Donor Services at 855.9HUNGER (855.948.6437).